I'm not often on this stretch of Touhy except during the spring, as the area seems to have everything I need for gardening. So, I was picking up some gardening supplies, and realized that finally, Fresh Farms was open - and I might now have a reason to come out here year-round. It struck me as an interesting combination: many things reminded me of a larger, more open Marketplace on Oakton - but with a deli counter that's more remeniscent of Lincolnwood Produce. They have something I'd never seen before - a whole freezer section devoted to Indian foods. I think they have a better chance of surviving than Grand Mart, as the market seems to be more European in flavor, and, at least in my quick perusal, the aisles seem to be more sensibly laid out and easier to use. 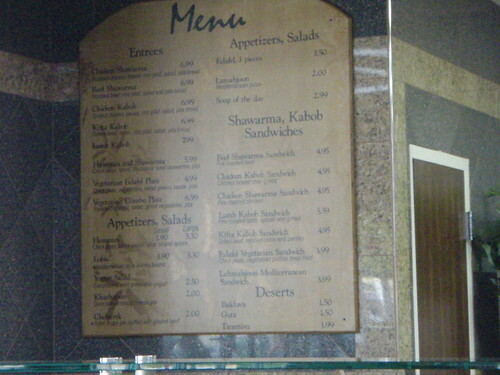 They also offer a juice bar and a small cafe featuring Middle Eastern specialties like schwerma, etc. The whole place sparkles. Following are some pictures I took hurriedly as I ran through the store, trying to pick stuff up before I had to head to Sparky's school. Thanks for the report. Can't wait to check this out but I have to use up some food first. After seeing your pictures, this place may get put on heavy rotation for me. 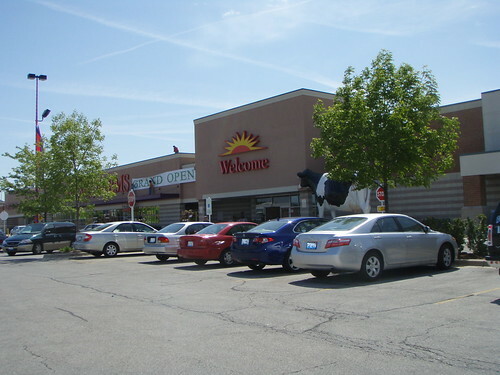 It's in the shopping center with a Walmart on the north side of Touhy. Thanks for the catch, grits! A neighbor of mine who has extensive PR experience representing some of the top restaurants/providers in Chicago and who is usually a very critical person when offering reviews . . . was estatic about this store when she called me earlier tonight to tell me about a visit this afternoon and she couldn't bring her self to stop singing its praises. She enjoyed it so well she wants to take me for a guided tour when I return from my trip to Seattle this coming weekend on the Empire Builder. I swung by here "just to pick up a couple things" before going over to Al's for my $1 beef. Mistake! I ended up spending $23 and could have spent another $100 just at the bakery and produce sections. Besides my chicken broth, blue cheese crumbles, pears and cream, I picked up coconut and passion fruit mousse in little cups (bakery), lobster bisque (canned soups), and two rectangular cheese logs (fig walnut and honey pistachio). I'm trying not to just swallow those whole and wait til I can get some crackers from home. What a nice brunch snack that will be tomorrow! 1) Didn't see cream. Asked an employee in the dairy section, "do you know where I can find cream?" His answer: "Cream?" with a gesture like, that tells me nothing, hurry up. I thought 'cream' was pretty self-explanatory, so I said, "you know, like milk". "We have sour cream, cream cheese, half & half..." "No, like heavy cream." "Whipping cream?" And he points to a shelf way at the top of the dairy section, near the cottage cheese. It was away from the half & half, and I didn't see it when I passed by. He had quite the 'I don't have time for this' attitude. This exchange would have been amusing if he wasn't so snippy. 2) I asked the checkout lady if they take coupons. She said she didn't know; she tried one earlier and it didn't work. She asked the checkout lady in the next line and the answer was, "If they scan, yes, and if not, then not." Thanks. Otherwise, with their cheap prices and the presence of Hole-in-the-Wall sketti sauce, I think this may be my new Jewel/Marketplace/Happy Foods. I just have to find a way to keep out of the bakery, and probably the ice cream section too. I happy, happy, happy girl. Have cooler full of vicious, fighting mad blue crabs for $1.99/lb (the most lively I've seen yet in Chicago) Giant bag of beautiful head-on shrimp for $2.99/lb. Slightly over ten pounds of rhubarb at $2.99/lb and 8 lbs of bright red strawberries at $2.99 for a 2 lb box. Grand opening sales are great - place was hopping and customers seemed much happier than those at Grand Mart (which I was pulling for, but which was not to be) I tired girl now. Thanks again for the precise location info! We hit there late this afternoon and it was hopping. 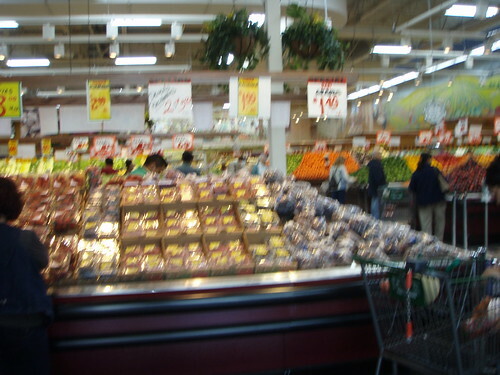 Prices were excellent and selection in many areas was great. 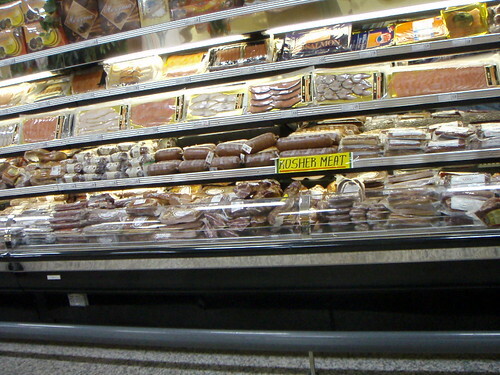 As noted above, the store skews somewhat towards Eastern European, especially in the deli, but like many in the area also carries substantial stock for Asian, Mexican, and Indian cuisines. 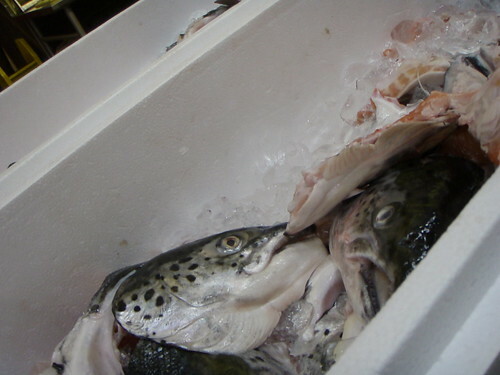 In addition, Fresh Farms also carries some higher-end organic products and fresh seafood of surprising variety. The produce section is much like the one at their store on Devon and Talman, but the deli is much bigger and there's a bakery. It's herring heaven in one refrigerator aisle with various herring in all sorts of intriguing packages, brines, sauces, flavors, and etc. We couldn't buy any today, having already loaded up at Costco first, but I'll be back for those. And attention fellow butter lovers: They have at least 15 kinds of butter from all over the world for sale. I bought some Czech butter called Jana Valley to test against my favorite Irish Kerrygold. Besides a number of small American makers, there was butter from England (including some claiming to be made from Devonshire clotted cream), Ireland, the Czech Republic, France, Russia, and more. I should mention also: the aisles are set up mostly by ethnicity, so each one is like going to a mini-ethnic-dry goods store: e.g. kosher, asian (they did have this one as a conglomerate of several things), polish/eastern european, mexican/latino, and most delightfully, an Indian spice section that really looks like that spice store on Devon, with all the stacked bags in cubbyholes - and the aisle labels make sense. 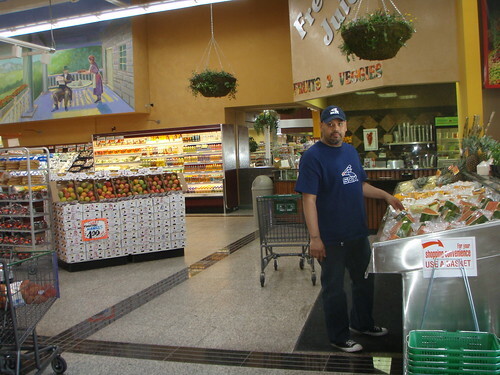 Some things appear in two or three or four aisles (lentils, for instance.) Things that cross cultures and are bought in bulk are arranged on the endcaps: there's a whole section with all the different huge bags of rice, and and endcap of olive oils. Even though stores like HMart and Marketplace are set up on this principle, I've never really figured out the logic completely - this seems like a model way to do it. Isn't this the same store that's in the mall on the Edens Plaza on Lake Ave. in Wilmette? Any reports? This is also the layout of Garden Fresh. Once you've cracked the code, it does lend an insider's feel, but it's certainly interesting that stores will cater to multiple ethnic markets rather than a catch-all strategy for the general marketplace. Mhays wrote: Isn't this the same store that's in the mall on the Edens Plaza on Lake Ave. in Wilmette? Any reports? Actually, that's Fresh Market (and neither should be confused with the long-gone Fresh Fields). I have been there, and it's skews a bit more upscale and towards baked goods, nuts, candies, specialty items and prepared foods. Really, more like Whole Foods than any of the multi-ethnic markets you mention. In fact, I think it was where the cheftestants shopped on Top Chef Miami. Fresh Farms looks intriguing. I will be sure to stop by when in the area. I love markets. I'm going to add to the positive things said about Fresh Farms and maybe even go a step farther and say that this is now my new favorite market. 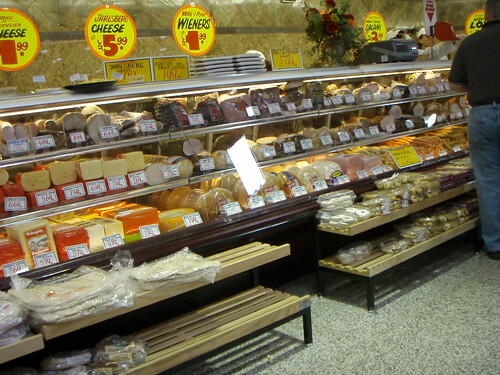 It has all the best of Lincolnwood Produce, Marketplace on Oakton and Devon all rolled into one "super market". Also, they even have the kind of everyday staples normally missing from ethnic markets that formerly required me to visit the dreaded Jewel. Kudos to the Fresh Farms people. stevez wrote: I'm going to add to the positive things said about Fresh Farms and maybe even go a step farther and say that this is now my new favorite market. Count me a Fresh Farms fan, glistening fresh fish, a United Nations of dry goods, lovely produce, clean as a whistle, reasonable pricing and a Giant Cow! $3.96 worth of mussels, two bags at $1.98 per, and a bunch of flat leaf parsley, combined with minced garlic, chopped scallion, butter and a good glug of dry sherry along with toasted day old bread made for a memorable Memorial Day lunch for my bride and I. Even had the pleasure of running into Burt and Sharron of Burt's Place. As an aside, Burt associates me with Habanero pizza, my typical special request, he loaded up on Habs, they freeze well. Two choice Delmonico steaks for $6.98, total, not per lb. Coarse salt, fresh cracked pepper, blisteringly hot cast iron pan. Tender, full beef flavor, nicely marbled,, exceptionally good, not on a sliding price scale, but overall. More than enough for two as there is half a steak leftover. Count me a Fresh Farms fan. The produce is incredible. It seems to take up about 1/3 of the store and goes on forever, and everything looks really fresh. My one produce nitpick is that I wish they had a few more types of little potatoes there (like fingerlings or something). All I noticed were "red boiling" and "white boiling" potatoes. There's so much produce there that I could have missed other potatoes around though. Also, there a a lot of bulk dried peppers, olive oils, and other goodies packed below the produce. If this is the only place for these goodies you could spend a couple of hours easy just looking at everything in this section. The cakes and refrigerated items in the bakery looked good but I did not sample. I almost bought the "Polish Jello Cake" but I'm trying to avoid desserts so I passed it by. The bread selection was sort of underwhelming. I tried a sample of challah and it had a "raw eggy" flavor and the texture wasn't that great. The danishes and poppyseed pastry looked very good but I didn't buy any. The deli had a lot of ham selections but was light on roast beef. I think they only had one choice for roast beef but I didn't think to ask. (I was already getting tired.) Also I was looking for Brie but there was only one brand that didn't look that great. They did have a large selection of Kerrygold cheeses (in the wax-paper-looking wrappers). I noticed a large and (I think) pretty well-priced selection of honey, with larger sizes available than usual. I wasn't shopping for honey so I kept moving. Also there's a very large section of bottled Polish salads. I think it took up about half a row. I kept an eye out for the cream since Pie Lady had a problem finding it. I wanted to see if I could spot it just looking where I would naturally and I didn't either. The dairy aisle in general had me a little confused because they segregated out some Greek and Mexican dairy. At that point it seemed like I'd been wandering for hours so I headed toward frozen desserts and then checkout. If you are looking at different ice creams, the kulfi is around the corner from the rest of the ice cream. I bought a few sorbets but was looking at the red bean frozen pops and avocado ice cream ($8.99). Last edited by grits on June 1st, 2009, 9:48 pm, edited 1 time in total. Forgot to mention that they carry Intelligentsia coffee. It is on the outside part of one of the aisles on the deli/meat side (not register side) so you have to keep an eye out for it. I believe it was all $11.99 except for a "Fresh Farms Blend" that was on sale for $9.99. I bought a bag of the Fresh Farms Blend but haven't tried it yet. Is that $11.99 for a 12-ounce bag? Thanks. fleurdesel wrote: Is that $11.99 for a 12-ounce bag? Thanks. I'm 99% sure I got the price right but since I didn't buy it I don't have a receipt to check. I believe this is the same price as Whole Foods on Peterson. Had my inaugural visit yesterday. Wow! My only reason for stopping by there was because I had to visit the US Cellular store around the corner. I didn't have a specific shopping list in mind as I had hit Jerry's on Wednesday. Just cruising down the aisles I can echo all of the previous posts. The place is freakingly clean. I ended up buying two bottles of Kefir - on sale for $1.99. The food at (I think) Pointe Place Grill smelled yummy and the prices were reasonable. Definitely on my Lincolnwood/Market Place/Jerry's/Garden Fresh rotation list. Was in the area today and thought I would check it out based on the comments. I agree with all the positive ones. I'd like to add a comment about the staff. Alan, one of the department managers, saw us looking around and asked if we needed any help. We thought we'd look for carob, so were kinda of wandering through baking goods, etc. He said they didn't carry it but he made a note and said check back soon. They wanted to put in a diabetic-oriented section but had not had time yet. I told him about the forum and he said he remembered someone running around the store taking pictures for posting somewhere. I gave him the URL and encouraged him to check out what is being said about the store. I'm definitely planning a big shopping trip back later in the week. PS - Not sure if anyone has mentioned it yet, but it takes a quarter deposit to get a shopping cart. Can't see what that is exactly necessary in that part of the suburbs. Rick T. wrote: PS - Not sure if anyone has mentioned it yet, but it takes a quarter deposit to get a shopping cart. Can't see what that is exactly necessary in that part of the suburbs. For starters, it eliminates the need to have employees spending time rounding up the carts. Also handy: there's a bill changer right next to the carts once you're inside, so if you forgot a quarter, you aren't out of luck. gleam wrote: Also handy: there's a bill changer right next to the carts once you're inside, so if you forgot a quarter, you aren't out of luck. Thanks! I didn't see it. They carry Lyle's Golden Syrup in the small British section at Fresh Farms. I've seen a few posts mentioning this. Also they had PG Tips, Typhoo, and some other teas in that area. Oddly, I don't remember seeing digestive biscuits in that section but I'm going to check again. Otherwise I can still go across the street to Jewel for my fix. I've been a fan of the quarter, essentially a "free" rental, carts since I saw them in Canadian supermarkets as a child and always wondered why they didn't make it down here. It forces less-responsible individuals to be more responsible. I like it. Also, it makes for a clutter-free parking lot as people are less apt to just leave it in the parking lot thereby sometimes leading to damaged vehicles. Made a quick stop last night and -- wow! Must go back again when I have more time. The Asian stuff is like H-Mart (although H-Mart is laid out like a Hanna-Barbera cartoon, you walk past the same products again and again), however the frozen Middle-Eastern and Indian products were really amazing. It's more like an International food museum - but you can buy the exhibits. The cheese island and sausage islands were also full of stuff I haven't seen elsewhere (and I love to shop for food). Also probably the most diverse selection of yogurt you'll find. I have a relative with Celiac and they not-only have an amazing breadth of GF product but also of FROZEN GF. Probably worth noting as a separate subject. How is their frozen berry selection? I might try this place next week - I've been doing some shop-hopping in an attempt to find the best deals. The one drawback I can see is the quality and diversity of the products - I visualize myself gaily flinging capers or morels into my cart, in that odd trance a really good grocery store can induce. Suzy Creamcheese wrote: How is their frozen berry selection? Not sure if this was a joke but I did look at the frozen berry selection. I like to make smoothies from frozen blueberries and strawberries. There was a small selection that didn't look compelling price-wise. The best prices I've found for frozen berries among non-Costco type stores are at Trader Joe's.